Mrs. H blogged about pumpkins , and got me to thinking. We’ve had a couple of pumpkin pies, and I’ve made pumpkin soup from the pumpkins I roasted and froze last fall. Why not ice cream? David Lebovitz, the author of the Most Dangerous Cookbook Ever, The Perfect Scoop, has on his blog a recipe for pumpkin ice cream. I’ve adapted his recipe, which is an adaptation of Karen DeMasco’s. 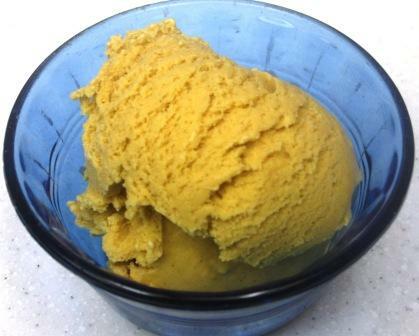 At first, I was hesitant to make pumpkin ice cream since it calls for first making an egg yolk custard. Inspiration hit when I was discussing the joys of owning a Vitamix with Mrs. M, who came over and helped me organize the pantry just off the kitchen. The Vitamix spins so fast that you can cook soup in it. Why not custard? First, I added the coconut milk and almond milk, the white sugar, plus all the spices and the salt. 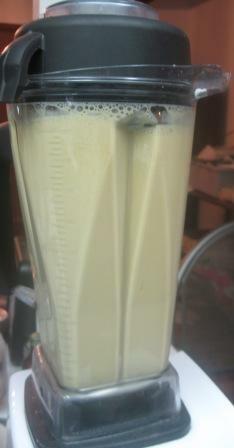 I blended them on high until they reached 140°. Since the purpose of getting the milk/cream hot is to infuse the spices, and I was blending them all together, I figured this would be close enough. If I really wanted to make the spice flavors pop, I’d fry them in a little coconut oil on the stove for 30 seconds. I’m lazy; what can I say? After the milk mixture was steaming, I took the center out of the lid while the blender was running on low and poured the egg yolks in, one at a time. I also added the brown sugar. Then I replaced the lid piece and cranked the whole thing back up on high. It took about 8 minutes or so to reach 170°, the upper end of the range that Lebovitz recommends for making sure the yolks are cooked. It was at this point that I realized that I didn’t have room in the blender for the pumpkin. Lebovitz’s recipe is for a one-quart machine. Mine’s a 2-quart, and I had a double-batch worth of pumpkin and egg yolks. (Mr. Caffeinated’s been doing angel food cake experiments again.) I doubled everything except the sugar, and it was plenty sweet. I recruited help in pouring two of the seven cups of custard through a strainer (to catch any cooked egg white) and added the pumpkin, vanilla and rum to the blender. Once this was fully combined, Mr. Caffeinated poured the contents through a strainer and combined it with the first two cups of custard. The whole batch went in the fridge overnight. We put it through the ice cream maker today. When it reached the consistency of soft serve, it went into the freezer to continue hardening. The kids were all outside playing when we decided to do a taste test. I don’t know about anyone else’s children, but mine are equipped with some sort of über-sensitive special detection equipment that tells them when we’re about to eat something containing sugar, so of course they all came plowing in the door just as we sat down to take a taste. I tried to convince them that Pumpkin Ice Cream is an adult flavor. Kids couldn’t like it. It contains (a) no chocolate, and (b) pumpkin, which is a vegetable. If using canned pumpkin, make sure to find one that’s 100% pumpkin. Often you’ll find cans of Pumpkin Pie Filling, which usually has spices and sweetener already added. Press the mixture through a fine mesh strainer before freezing, as directed. 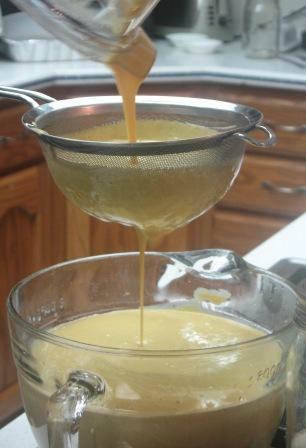 Pumpkin can be slightly grainy and straining the custard is a good idea to help smooth it out. Turn blender to medium/low, and remove center from lid. Pour egg yolks through the lid while blender is still going. Add brown sugar as well. Replace lid cap, and crank it up to the highest speed. Take temperature periodically till mixture reaches 160 – 170°. Pour a couple of cups of custard through a fine mesh sieve into a large mixing bowl. 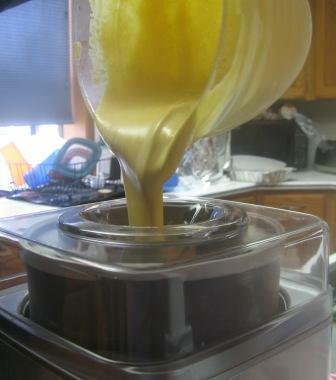 Add pumpkin, vanilla and liquor (if using) to the rest of the custard still in the blender. Blend just enough to combine thoroughly. Pour through sieve into the mixing bowl with the rest of the custard. Stir briefly to combine. Cover and refrigerate overnight or until completely chilled. Lock the kids out of the house before sampling. Label container “Pumpkin Tofu” or something similar if you want to have more than just one serving for yourself. This entry was posted in Allergy-Friendly, Desserts and tagged DF pumpkin ice cream, pumpkin ice cream, pumpkin ice cream Vitamix, Vitamix ice cream. Bookmark the permalink.